US public health dietary advice was announced by the Select Committee on Nutrition and Human needs in 19771 and was followed by UK public health dietary advice issued by the National Advisory Committee on Nutritional Education in 1983.2 The dietary recommendations in both cases focused on reducing dietary fat intake; specifically to (1) reduce overall fat consumption to 30% of total energy intake and (2) reduce saturated fat consumption to 10% of total energy intake. Although a number of reviews of RCTs have been undertaken,8–10 no review has examined the RCT evidence available at the time dietary fat guidelines were introduced. Furthermore, these guidelines have not been changed since they had been announced; correspondingly, the validity of their evidence base remains relevant. This systematic review and meta-analysis will assess if the published RCTs available to the dietary committees supported their recommendations on dietary fat. With this in mind, we hypothesised that RCT evidence available to the dietary committees at the time of issuing recommendations did not support the contention that reducing dietary fat intake would contribute to a reduction in CHD risk or related mortality. A search was undertaken to identify RCTs that examined the relationship between dietary fat, serum cholesterol and mortality. Exclusion criteria were: study being observational; non-randomised and/or multifactorial in design. Inclusion criteria were: randomised dietary intervention studies; study hypothesis relating to a reduction or modification of dietary fat or cholesterol; participants were human adults; study was a minimum of 1 year in duration; data on all-cause mortality, CHD mortality and cholesterol measurements were available. Searches were performed of the literature to 1983 using MEDLINE and the Cochrane Library. The AMED, CAB abstracts, CINAHL, EMBASE, HMIC and SIGLE (grey literature sources) were not relied on, as their periods covered were not compatible: from 1985, 1973, 1981, 1980, 1983 and 1992, respectively.12 ,13 (figure 1). To ascertain the validity of eligible randomised trials, a pair of reviewers (ZH and FG) worked independently to determine which studies met the inclusion criteria. The same six were agreed on. Risk of bias was further assessed using the PEDro scale for the relative quality of studies.22 Additionally, the meta-analyses for all-cause mortality (figure 2) and CHD deaths (figure 3) were tested for sensitivity analysis of the exclusion of any one study. Estimates of total mortality (95% CIs) from meta-analysis. Estimates of CHD mortality (95% CIs) from meta-analysis. The identified RCTs included a total of 740 deaths and 423 deaths from CHD among 2467 male participants (table 1). All but one trial exclusively studied secondary prevention participants. The LA Veterans Study17 comprised one-fifth secondary participants and four-fifths primary participants. All trials were parallel and randomised. Two were blinded for outcome assessment.15 ,16 Two were open, with no blinding on either side.19 ,20 The LA Veterans study17 was reported as double blinded, but the dietary changes were so substantial that this seems implausible (egg consumption quantified, vegetable oils added and animal fats restricted). Rose et al14 was reported as blinded to intervention participants for the type of oil, but not blinded for outcome assessment. The mean duration of the six trials was 5.4±3.5 years. The weighted mean (person years by people) was 6.5±1 years. Quality scores were moderate and relatively homogenous: all trials had quality scores of 4 or 5 using the PEDro scale.22 The meta-analyses for all-cause mortality (figure 2) and CHD deaths (figure 3) were tested for sensitivity analysis of the exclusion of any one study. There were no circumstances in which the exclusion of any one study made the overall effect size significant. Statistical evidence for substantial between study heterogeneity was not found. For all deaths, the Q-value was 7.115 (6° of freedom). I2 was 15.676 and T2 was 0.006. For CHD deaths, the Q-value was 8.649 (6° of freedom). I2 was 30.632 and T2 was 0.028. Visual inspection of the funnel plots revealed that none of the studies lay outside the SE funnel for the meta-analysis of all deaths or CHD deaths. The two, small, Rose et al14 studies produced asymmetry on the lower right hand side of the funnels. Egger's regression test confirmed some asymmetry, noting the caution for the small number of studies.25 The Egger’s regression intercept was 1.029 (95% CI two-tailed, −0.433 to 2.492) (one-tailed p=0.065; two-tailed p=0.130) for the all deaths meta-analysis and 1.554 (95% CI two-tailed, −0.013 to 3.121) (one-tailed p=0.025; two-tailed p=0.051) for CHD deaths. Five of the six RCTs did not examine either a total fat consumption of 30%, or a saturated fat consumption of 10%, of energy intake. The trials examined: the administration of vegetable oil;14 ,16 ,17 ,19 the replacement of saturated fats with vegetable oil;16 ,17 ,19 and an approximate 20% fat diet.15 A single RCT20 examined the consequence of a 10% saturated fat diet and reported a higher incidence of all-cause mortality and CHD deaths in the intervention group. Across six studies containing seven dietary interventions14 involving 1227 people in the intervention groups and 1240 people in the control groups, there were 370 deaths in the intervention and control groups. The all-cause mortality was 30.2% in the intervention groups and 29.8% in the control groups. In the meta-analysis of all-cause mortality, the LA Veterans study17 carried the greatest weight, 41.71%, (figure 2 random effects methodology). The corn and olive oil interventions had negligible impact on the overall effect, with weights of 0.46% and 0.41%, respectively.14 The risk ratio (RR) for all seven studies was 0.996 (95% CI 0.865 to 1.147). The overall effect measurement lies on the line of no effect. There was no statistically significant relationship between dietary interventions and all-cause mortality. The seven interventions recorded 207 deaths from CHD in the intervention groups and 216 in the control groups. 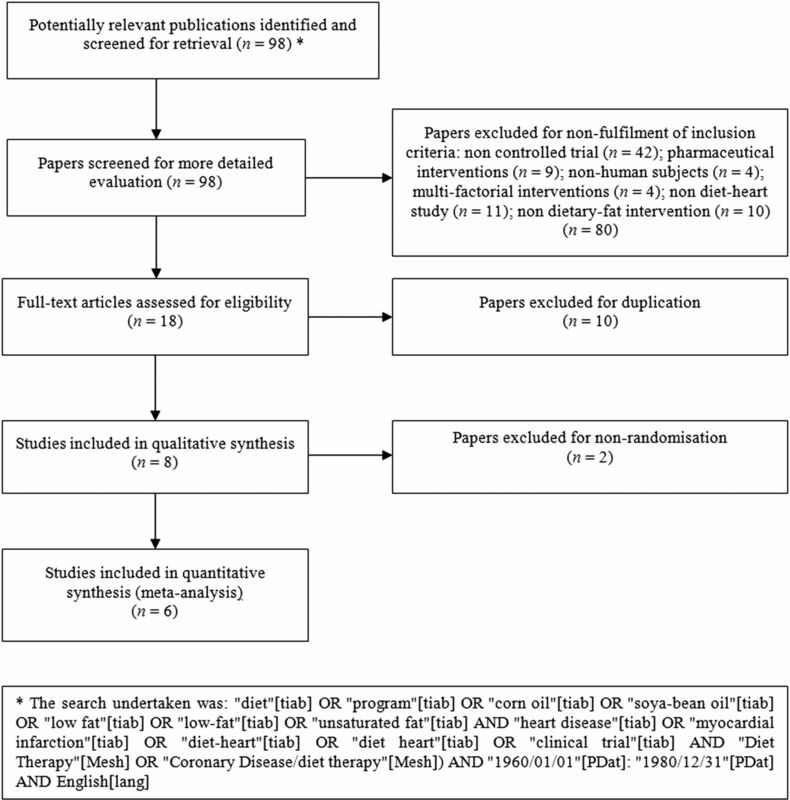 The forest plot for the dietary interventions and deaths from CHD produced the meta-analysis is shown in figure 3 (random effects methodology). In the meta-analysis of CHD mortality, the Leren Oslo study19 carried the greatest weight, 34.16%, (figure 3 random effects methodology). The corn and olive oil interventions carried the least weight with 1.22% and 1.09%, respectively.14 The RR for all seven studies was 0.989 (95% CI 0.784 to 1.247). The overall effect measurement lies on the line of no effect. There was no statistically significant relationship between dietary interventions and heart deaths. Three studies15–17 and the olive oil14 intervention reported no significant differences in deaths. The corn oil deaths were reported as significantly different, in favour of the control group (0.1>p>0.05).14 Leren19 reported that the difference in all-cause mortality was not statistically significant (p=0.35). The total CHD mortality was 79 out of 206 men in the diet group and 94 out of 206 men in the control group (p=0.097). Woodhill et al20 recorded 39 deaths in the intervention group and 28 in the control group. There were 35 deaths from CHD in the intervention group and 25 in the control group. These were described as significant, but not endorsed by statistical analysis. Mean serum cholesterol levels fell in all groups: control and intervention. The standardised mean difference in serum cholesterol levels, for the six trials (seven interventions) combined, was −12.6%±6.7% for the intervention groups and −6.5%±5.1% for the control groups (table 1). The effect size was 1.04. The main findings of the present meta-analysis of the six RCTs available at the time of issuing dietary guidelines in the US and UK indicate that all-cause mortality was identical at 370 in the intervention and control groups. There was no statistically significant difference in deaths from CHD. The reductions in mean serum cholesterol levels were significantly higher in the intervention groups; this did not result in significant differences in CHD or all-cause mortality. It is a widely held view that reductions in cholesterol are healthful per se. The original RCTs did not find any relationship between dietary fat intake and deaths from CHD or all-causes, despite significant reductions in cholesterol levels in the intervention and control groups. This undermines the role of serum cholesterol levels as an intermediary to the development of CHD and contravenes the theory that reducing dietary fat generally and saturated fat particularly potentiates a reduction in CHD. The LA Veterans study17 recorded the lowest RR for CHD deaths for the intervention group: 0.816 (figure 3). However, there were important differences in the groups at study entry. The intervention group had 12 octogenarians, compared with 21 in the control group. Eleven per cent of the experiment group were heavy smokers (more than one pack a day) compared with 17% of the control group. Woodhill et al20 made an important observation that men who have suffered an myocardial infarction (MI) subsequently make multiple lifestyle changes (weight loss, smoking cessation, increase in physical activity, for example), which makes them a poor group for testing the lipid hypothesis. In this respect, the reporting of cholesterol decreases in control and intervention groups supports the observation that multiple lifestyle changes are made. Studies of the time report weight, not body mass. Weight changes were not recorded in two studies.14 ,19 The two studies noted no significant weight change in intervention or control groups.16 ,17 The Research Committee study15 reported mean weight loss as 7.5% in the intervention group and 4.8% in the control group. Woodhill et al20 reported a mean weight loss of 6.5% and 6% in the intervention and control groups, respectively. A limitation of the present review and meta-analysis relates to the detailed information in the original studies in order to determine the saturated, monounsaturated and polyunsaturated content of the control and intervention diets. Woodhill et al20 was the only study to detail the composition of the three fats in the intervention and control diet; a 10% saturated fat intake being the intervention goal. Leren19 documented the intervention diet as 40% of total calories as fat; 8.3% of total calories as saturated fat and a polyunsaturated to saturated fat ratio of 2.4:1. No comparable measures were given for the control diet in this study. Other studies recorded total fat intake as a percentage of calories, but not individual fat composition. Consequently, deductions about the relationship between different fats and serum cholesterol levels cannot be made. Deductions can be made about the dietary interventions and mortality from all-causes and CHD. The Rose et al14 interventions most notably favour the control in both forest plots, but the wide CIs render these, as with all the studies, non-significant. Only one study made a positive claim for its intervention after 5 years18 and subsequently, this was moderated.19 Rose et al14 warned of possible harm by administering corn oil. The Research Committee15 concluded “A low-fat diet has no place in the treatment of myocardial infarction” (p504). The MRC Soya-bean oil16 intervention found no evidence that MI relapse would be materially affected by unsaturated fat in the diet. The LA Veterans study17 reported that total longevity was not affected and expressed concern about unknown toxicity of their intervention. Woodhill et al20 noted that survival was significantly better in the control than the diet group. In the absence of epidemiological evidence from whole-populations, large-scale RCTs of longer duration (with adequate follow-up), which accounted for known confounding variables and included primary participants of both males and females, may have supported the introduction of dietary fat guidelines in 1977 and 1983. However, this opportunity expired when universal pharmacological treatment became the accepted norm. From the literature available, it is clear that at the time dietary advice was introduced, 2467 men had been observed in RCTs. No women had been studied; no primary prevention study had been undertaken; no RCT had tested the dietary fat recommendations; no RCT concluded that dietary guidelines should be introduced. It seems incomprehensible that dietary advice was introduced for 220 million Americans28 and 56 million UK citizens,29 given the contrary results from a small number of unhealthy men. An exchange between Dr Robert Olson of St Louis University and Senator George McGovern, chair of the Dietary Committee, was recorded in July 1977.30 Olson said “I pleaded in my report and will plead again orally here for more research on the problem before we make announcements to the American public.” McGovern replied “Senators don’t have the luxury that the research scientist does of waiting until every last shred of evidence is in”. There was best practice, randomised controlled trial, evidence available to the dietary committees, which was not considered and should have been. The results of the present meta-analysis support the hypothesis that the available RCTs did not support the introduction of dietary fat recommendations in order to reduce CHD risk or related mortality. The present review concludes that dietary advice not merely needs review; it should not have been introduced. Select Committee on Nutrition and Human Needs. Dietary goals for the United States. 1st edn. Washington: US Govt Print Off, 1977. National Advisory Committee on Nutritional Education (NACNE). A discussion paper on proposals for nutritional guidelines for health education in Britain, 1983.
. Coronary heart disease in seven countries. Summary. Circulation 1970;41(4 Suppl):I186–95..
. The effect of plasma-cholesterol-lowering diet in male survivors of myocardial infarction. A controlled clinical trial. Bull N Y Acad Med 1968;44:1012–20.
. Cochrane handbook for systematic reviews of interventions. The Cochrane Collaboration, 2011;Version 5.1.0. Comprehensive Meta Analysis Version 2 [program]. 2 version. Englewood, NJ: Biostat 2005.
. Scientific Opinion of the Panel on Dietetic Products Nutrition and Allergies on a request from Unilever PLC/NV on Plant Sterols and lower/reduced blood cholesterol, reduced the risk of (coronary) heart disease. EFSA J 2008;781:1–12. United Stated Census Bureau. U.S. Resident Population, 1977. Office for National Statistics. Population Estimates for UK, England and Wales, Scotland and Northern Ireland, Mid-1982 to Mid-1990 Population Estimates for England & Wales. Office for National Statistics, 2003. CBS News. Exchange between Dr Robert Olson and Senator George McGovern from The United States Senate Select Committee on Nutrition and Human Needs. Washington, 26 July 1977. Contributors ZH conceived of the study and was the major contributor to data extraction, writing of the manuscript and the meta-analysis. FG was involved in data extraction, writing of the manuscript and the meta-analysis. BD was involved in writing of the manuscript. NS was involved in the meta-analysis. All authors contributed to the manuscript. All authors were involved in critical evaluation of content. Data sharing statement The PRISMA checklist can be shared with the publication. The full list of papers from the first search return can be obtained from the corresponding author (excel file). The Comprehensive Meta Analysis files can be shared with other users of the CMA package—available from the corresponding author.